Tony’s green beans may be done for the season, but we’re not done with green beans. We won’t be for a long time, either. It’s one of the few vegetables that is reliably available throughout the year. 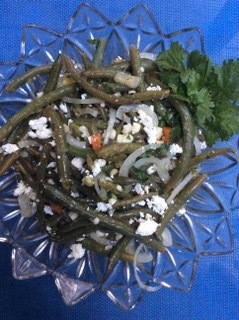 Before the corn is finished, though, you will want to make one more green bean salad. I found the recipe in a Rick Bayless book. He’s the lauded chef of Chicago’s Frontera Grill and Topolobampo modern Mexican restaurants, and he’s never steered me wrong. I thought this may be the first time, though, when I made his green bean salad. It was OK. Nothing special. None of the explosive flavors Bayless is noted for. Then I tasted the salad after a night in the fridge. Whoa. The unassuming little green bean salad had gone gonzo. The flavor was amped in all the right ways. I ate some for breakfast. Yum. The recipe that follows is mostly Bayless’s, although I added corn kernels because ’tis the season, and crumbled feta for a counterpoint of creaminess. I also swapped sweet onion for red because that’s what I had on hand. If you have any potlucks coming up, make this a day in advance and treat your friends. For the salad, cook green beans in boiling water just until tender, about 5 minutes; drain and refresh under cold running water to stop the cooking. Drain well and transfer to a serving bowl. Add onion, corn and feta and gently toss. For the dressing, combine the oil, salsa, lime juice and salt in a lidded jar and shake well and add more salt if necessary. Drizzle about 1/3 cup over the salad and toss well. Refrigerate the remaining dressing for another use. Scatter cilantro over salad, cover with plastic wrap and refrigerate at least 1 hour, preferably overnight. The flavor continues to develop as it sits. Toss again before serving. Makes about 4 servings. From “Mexican Everyday” by Rick Bayless. Cuban roast mojo pork shoulder and baked sweet potatoes; open-faced sandwich of Cuban roast pork, pickled red peppers, pesto and avocado on toasted seeded bread; roast chicken thighs over carrots, green onions and branches of thyme with white wine and roasted beets. Chipotle burrito bowl with double carnitas; salad with grilled chicken and pita wedges at Alexandris Restaurant in Wadsworth; small spicy Thai salad with chicken, baguette and iced coffee at Panera. On the topic of mayo vs. salad dressing, I grew up with Miracle Whip and have never really been able to choke down mayo unless it’s well-disguised with Hidden Valley Ranch. I think it’s the eggy-blandness texture I couldn’t get past. I had aways used Miracle whip on sandwiches and in macaroni and egg salads. My mother, who raised me on Miracle Whip, now reports that she has always liked mayo better but salad dressing was cheaper to feed a family. Over the years I have also noticed that my egg and mac salads seemed to deteriorate on day two, and over time would turn into a watery mess. Imagine reading your discovery of my issues and to know I wasn’t the only one with these problems! Then I remembered Mom sometimes bought Spin Blend salad dressing… When I looked, no Spin Blend at Acme or Giant Eagle but I found it at 2 for $6 at Marc’s. Just a heads up for anyone looking for it. Spin Blend! I haven’t thought of that brand in years. When I was little we were a Miracle Whip family. But I bet a lot of people are switching since Kraft reduced the fat, causing Miracle Whip to become watery in salads over time. My harvest last week was a bunch of tomatoes, five gnarly carrots, one fat 6-inch yellow squash, four small beets and two Chinese eggplants. If you don’t count the tomatoes, that’s a pitiful pile of vegetables. I couldn’t have been prouder. Baby beets fresh from the ground! Slender eggplants still warm from the sun! To me, every bite I grow is a mini miracle. I grew THAT? Actually, more carrots and beets nestle under the soil and I have hopes that more eggplants and squash are on the way. Not many, but a few. Last week I harvested just enough for one big roasting-pan meal. Hoo-boy! I thawed some chicken thighs and got to work. First I made the flavoring — lemon juice, crushed garlic and salt and pepper left to steep in a bowl. Rather than pile the chicken and vegetables on a baking sheet and slide it into the oven, I took the time to brown the skinless chicken first on the stove. 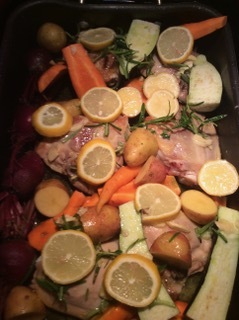 I used a roasting pan and afterward added all the vegetables, the lemon-garlic mixture, fresh rosemary and lemon slices. For not much work, Tony and I had a fragrant, deeply flavored all-in-one dinner with enough leftovers for lunch and dinner the next day. Yum. Preheat oven to 450 degrees. In a small bowl, whisk together lemon juice, 1/3 cup olive oil, garlic, salt and pepper. Set aside. Heat the 3 tablespoons olive oil in a roasting pan over medium-high heat. Season chicken with salt and pepper and brown in oil. Remove from heat. Scatter vegetables in pan. Pour lemon juice mixture over all. Top with rosemary and lemons. Roast uncovered at 450 degrees for 50 to 60 minutes, until chicken is done and vegetables are tender. Serve with lemony pan juices. Makes 4 servings. Roast chicken thighs and vegetables with lemon and rosemary; green bean salad with onions, feta and tomatillo dressing, grilled rib steaks rubbed with smashed green and black peppercorns, baked sweet potatoes; open-faced sandwich of tomato, avocado and feta cheese with pesto on seeded bread; grill-roasted whole ancho-rubbed chicken, grilled corn on the cob and fresh sliced peaches with whipped topping. Pulled pork plate with half of a corn muffin and green beans at Old Carolina Barbecue in Fairlawn; fajita chicken strips, lettuce, sautéed onions and green peppers at Rockne’s in Fairlawn; an egg over easy, a turkey sausage, a biscuit, grits and coffee at Bob Evans. Hanging from a crossbeam in my kitchen this week are big bunches of tarragon, fennel leaves, thyme, rosemary and sage. I cut the stalks of each variety the same length and tied them with thread. When dry, I’ll transfer the herbs to zipper-lock plastic bags and store them in my spice cabinet. I may strip the tarragon from the stalks and store it in bottles this year, but plastic bags really are good enough for me. That’s about it for my herb harvest this year, besides the pesto in the freezer and a few leaves from my potted bay laurel that are drying on a counter in case the bush doesn’t make it through the winter indoors. I grow other herbs but I don’t preserve them. Dried parsley and chives have no flavor, so why bother? Minty-weird dried basil tastes like a mistake compared to fresh. Dried cilantro leaves don’t excite me (although if you let cilantro go to seed, you can harvest and grind that fragrant form). In my opinion, not all herbs are worth drying. But you CAN have the flavor of fresh herbs in the winter without paying off-season prices for tiny bunches of wilted leaves. If you want the flavor of fresh basil, cilantro, parsley and chives in the winter, I suggest you puree the leaves with enough oil to form a dense sludge, freeze it in ice cube trays, transfer to zipper-lock bags and freeze. The flavor will remain fresh. If you are near Seville, home of the Bates Giants AND giant zucchinis, in the near future, stop by Geig’s Orchard just north of town on Rte. 3 for their “bubblegum” plums. Even though you have your own stash of the fruits, these are super-sweet, little round plums that are just plain fun. The peaches are pretty wonderful, too. The plums are still available according to the website. I hope to make it there before plum season segues into pear season. Thanks for the tip. One of your readers mentioned Rumford Baking Powder as the secret to her light pancakes. I thought all baking powders were made with the same ingredients. Am I wrong? They all contain sodium bicarbonate but the add-ins — one or more weak acids and cornstarch— can vary. The proportions can, too. I haven’t noticed a difference in brands of baking powder, but when I used an off brand of baking soda once, it affected the flavor of my biscuits. This is odd, because baking soda is 100 percent sodium bicarbonate with no fillers. Zucchini brings out the curmudgeon in me. I have opinions. I have likes and dislikes. I don’t like the floppy fried zucchini rounds, unbreaded and dripping with oil, that my mother served us growing up. I kind of sneer at zucchini breads and muffins because what’s the point if you can’t taste the zucchini? And I am anti any zucchini that is more than about 8 inches long. The skin is tough and the seeds become tiddlywinks. I like just about everything else about this summer squash, which, chameleon-like, soaks up any flavor it touches. I like it stuffed and baked, layered with tomatoes in summer casseroles, cut into batons and tossed in pasta salads, even used as a stand-in for tofu in ma po bean curd. So I was excited to see what contestants would come up with in the Seville Farm Market’s annual Zucchini Smackdown recently. I got to judge the fun contest this year. I came away with a terrific recipe for zucchini relish. 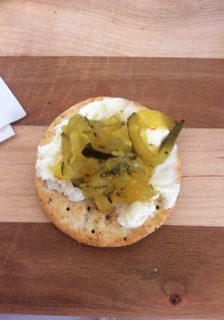 It is sweet, tart and crunchy-good on a cracker smeared with cream cheese. If only I could grow zucchini, I’d made a ton of it. 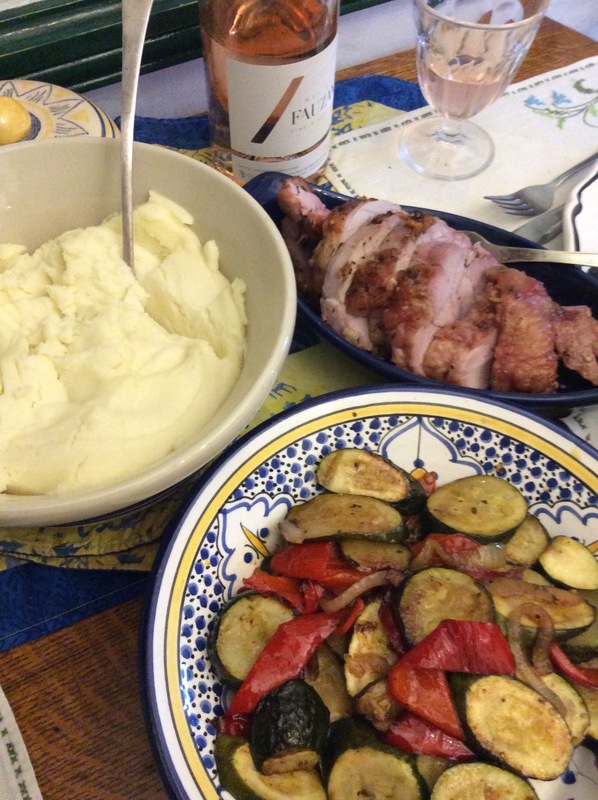 The recipe was submitted by Laurie Racco of Medina. The winning sample was a family affair, she said, with plenty of spoons in the pot. 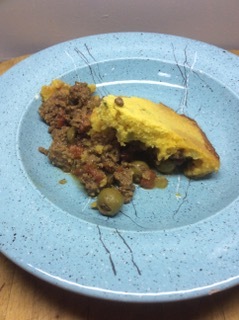 Racco kindly forked over the recipe. But because gardeners probably have a lot more zucchini than recipes right now, I’m also sharing a recipe for bacon-studded zucchini slaw from my own files. In an extra-large nonmetal bowl, combine zucchini, onion and bell peppers. Sprinkle with pickling salt; toss gently to coat. Add enough cold water to cover vegetables. Cover with plastic wrap and allow to stand at room temperature for 3 hours. Transfer vegetable mixture to a large colander set in sink. Rinse with cold water; drain. In an 8- to10-quart stainless steel, enamel, or nonstick pot, combine sugar, vinegar, ¼ cup water, celery seeds, turmeric and mustard seeds. Bring to boil, stirring until sugar dissolves. Reduce heat and simmer, uncovered, for 3 minutes. Add drained zucchini mixture (and food coloring if desired). Return to boiling, reduce heat and simmer, uncovered, for 10 minutes, stirring occasionally. Ladle hot relish into hot, sterilized half-pint jars, leaving ½-inch head space. Process in a boiling water canner for 10 minutes after water returns to boil. Remove jars from canner, cool and rack. Yields 5 half-pint jars. Fry bacon in a 10-inch skillet until crisp. Meanwhile, shred zucchini with a hand grater or a food processor. Remove bacon from skillet and drain on paper towels. Add shredded zucchini to bacon fat in skillet. Season with salt and stir-fry 2 to 3 minutes, until glossy but still crisp. Sprinkle sugar over zucchini, add vinegar and stir well. Turn heat to high and boil rapidly until vinegar is almost evaporated. Zucchini should still be fairly crunchy. Transfer zucchini and any liquid remaining in pan to a bowl. Crumble bacon and stir into zucchini. Stir in caraway seeds. Cool. Serve at room temperature. Makes 4 servings. Ciabatta pizza with chopped tomatoes, basil, garlic, pesto, mozzarella, feta and Parmesan cheeses; grilled American, feta and fresh mozzarella cheeses on seeded brown bread with pesto, tomato and avocado; Szechuan stir-fry pork with eggplant, yellow squash, carrots, onion and pepper; spaghetti and meat sauce with walnuts. Pulled pork, green beans, vinegar slaw and corn muffin from Old Carolina Barbecue in Fairlawn; a California roll, karaage (fried) chicken and salad at Tensuke Market in Columbus; thick lamb chops, garlic mashed potatoes and pan-grilled rainbow carrots at Wise Guys in Akron. I have been inspired to work at making my own vanilla extract, as it appears most of the work is putting the vanilla beans into a clean jar with a tight seal and covering it with vodka. I guess I’m a vanilla bean snob, as I really can taste the difference when it is real vanilla, and I use it often. The question is, where and how do I purchase bulk vanilla beans, how do I know which is the good stuff, and how do I avoid being part of the problem of Americans who, I am told, are decimating the vanilla planters’ business because we want too much vanilla? Unless you’re planning on going into business, you won’t need to buy vanilla beans in bulk; a big jar of homemade extract requires just five beans. That should simplify your search. If possible, buy vanilla planifolia beans, also called Bourbon vanilla, which are considered superior to vanilla tahitensis. Most planifolia beans are grown now in Madagascar; and tahitensis in Papua New Guinea, although the orchids that produce both kinds of beans have been planted as far afield as Uganda and even, lately, in California. Demand for vanilla is very high, and the “decimation” you mention is the result of growers (especially in Madagascar) skipping steps and hurrying beans to market. That has affected the quality of some of the beans. This year’s harvest, which began in July in Madagascar, the premier producer, is expected to be large, which may bring down prices and temper the greed of producers, according to market reports. Your best bet is to buy from a reputable source, such as West Point Market or vanilla expert Patricia Rain at vanillaqueen.com. Place the beans and alcohol in a lidded jar, cover tightly and store in a cool, dark place, shaking once a week. The longer the beans steep, the stronger the vanilla will be. Steep for several months to a year for the best flavor. Pour into decorative bottles if desired, including a piece of vanilla bean in each one. Cap tightly. It’s peach season, that time of year when I used to feel like Forest Gump with a box of chocolates. With peaches, I never knew what I was getting. They could be candy-sweet and dripping with juice or as dry and tasteless as cotton. Then I wised up. Here’s how to buy a juicy, sweet peach rather than a dry, flavorless one: Check its provenance. The closer to home the peach was grown, the better the chance it’s a good one. That’s because peaches soften but do not ripen after they are picked. Fruit that has far to travel usually is picked while still firm and unripe, to cut down on bruising on the journey. There are exceptions. Some California growers are shipping a relatively new hybrid developed there that arrives as sweet and juicy as peaches grown down the street. Many growers aren’t, though, so if my only option is a California peach, I usually buy one to test before committing. If the peaches in the store are firm but from Georgia, North Carolina or even closer states, I will buy some and soften them on my kitchen counter. I am usually rewarded with juicy, sweet peaches. Of course, the best peaches are the ones from a nearby orchard, but the season is brief here in Ohio and we must make do. This summer I have eaten my share of South Carolina and Georgia peaches while waiting for Ohio’s crop to ripen, which it is doing right now. I rarely make peach pies because of my promise to stay away from sugar, but this summer I yearned for one so badly that I caved — in a tiny sort of way. Instead of an entire, glorious pie I made muffin-sized peach-caramel upside-down pies. I melted some sugar in a 4-inch skillet, stirred in cold butter and transferred two teaspoons to each of six muffin-tin cups. 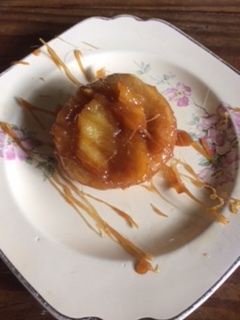 I arranged three peach slices over the caramel and topped them with rounds of puff pastry dough cut slightly larger than the holes of the muffin tins. The pastry puffed and browned in the oven, while the peaches slumped into the caramel. When done, I inverted the baked tarts onto a tray, pounding on the muffin tin to loosen the pastry and caramel. By the end of the day I had eaten three of them — not a whole pie, but still. Luckily, Tony ate the rest. Butter a muffin tin with six cups. Roll pastry on a lightly floured surface to smooth out creases and enlarge the pastry slightly. With a biscuit cutter or drinking glass slightly larger than the muffin cups, cut out six rounds. Set aside. Over medium-low heat, melt sugar in a small (preferably 4-inch) skillet or saucepan., stirring often. Do not allow sugar to burn. When the melted sugar is a rich amber color, stir in the cold butter bit by bit. Remove from heat. With a measuring spoon, place 2 teaspoons of the caramel in the bottom of each muffin tin cup. Peel the peaches and cut into 1/2-inch-thick slices Arrange 3 slices over the caramel in each cup. Place a pastry round over each cup, tucking in edges. Bake at 400 degrees for about 30 minutes, until the pastry is golden brown. Cool 2 or 4 minutes, then invert the muffin tin onto a tray or cookie sheet, pounding the muffin cups to release the tarts. Transfer to dessert plates with a spatula. If desired, reheat remaining caramel and spoon more over the tarts. Makes 6 servings. Does anyone know where lamb can be bought at a reasonable price? Lamb is my favorite meat, but supermarket prices have soared. I would even consider buying a half or whole lamb from a farm (butchered and wrapped) if the price isn’t too ridiculous (often the case at boutique farms). Thanks for any advice. Skinny eggplants roasted with sweet soy sauce; pan-grilled strip steak with blue cheese crumbles, French potato salad with garlic and mint; cantaloupe with prosciutto, cherry tomato clafoutis; lettuce-wrap chicken tacos with avocado and cucumber; beef stir fry with zucchini and yellow peppers; caramel peach upside-down tarts. Curry noodles with chicken and vegetables at House of Hunan; chili dogs with mustard and onion from the Sassy Dog cart at Copley Circle; a beef turnover (fatayer), kibbee with homemade yogurt and mujadara (lentils and caramelized onions) at the Lebanese Festival at Our Lady of the Cedars Maronite Catholic Church in Fairlawn; an appetizer sampler of beef samosa, vegetable pakoras, sliced sausage and chicken skewers, and potato-stuffed naan bread at Jaipur Junction in Hudson (excellent). My grandmother used to make bean soup. 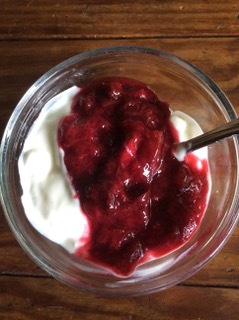 She added summer savory to the pot and a big dollop of sour cream at the end. Delicious! A friend of Hungarian heritage also adds sour cream to her bean soup. It is indeed delicious. I am looking forward to trying your recipe for green bean and potato soup because we have a lot of beans from our garden. But how many pounds (approximately) is 2 quarts of beans? Thanks very much. One quart of green beans equals about one pound. While looking up the answer in my well-thumbed copy of “The Victory Garden Cookbook” by Marian Morash, I saw that she has a recipe for shell bean and green bean soup with pistou. So I guess I didn’t invent THAT idea, either. I’ve been following your laments about an over-abundance of garden green beans. I have the same dilemma in summer. Here’s a very tasty and healthy recipe originally from Food Network Kitchen. I’ve adapted it by adding ginger and scallions. Meanwhile, preheat broiler. Toss beans with 1 1/2 tbsp. of the oil and the sugar on a rimmed baking sheet. Broil 4 minutes. Stir, adding in scallions. Continue to broil for 4 to 5 minutes, until beans are tender and charred. Heat remaining 1 1/2 tbsp. oil in a large skillet over high heat. Add turkey and cook, breaking it up with a wooden spoon, until browned, about 3 minutes Add garlic, pickle, chili paste and ginger and cook about 3 minutes more. Whisk chicken broth with soy sauce, sherry and cornstarch in a small bowl. Add the beans and scallions to the skillet with the turkey, stirring 1 minute. Add the soy sauce mixture and cook, stirring until the sauce thickens, about 2 minutes. Serve with the rice. Makes 4 servings. Thanks. This should use up Tony’s remaining crop of green beans. I will definitely try the ham and bean soup with pesto. It looks delicious. My grandmother made a ham and bean soup with “dumplings” — basically dough boiled in the broth. We called it “pot pie.” Someone once told me it was a Pennsylvania Dutch recipe. I’ve only tried it twice. Her recipe gave no amounts and no recipe for the dumplings. I came close the second time. I don’t understand when people won’t share their recipes. I can help with that recipe. My grandmother was Pennsylvania Dutch and made “pot pie” often. I once printed directions in Recipe Roundup in the Beacon Journal. 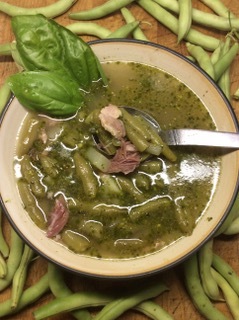 Readers said the soup part was made with chicken or ham hocks, potatoes and onions, but there’s no reason the noodles wouldn’t work in green bean soup. Combine flour, salt and baking powder in a large bowl. Cut in butter. Make a well (depression) in the flour and break the egg into the well. With a fork, stir flour into the egg a little at a time while gradually adding enough milk to make a soft dough. Dust dough with flour and roll out as thin as possible. With a sharp knife, cut into 1 1/2-inch squares. Drop the dough squares into soup one by one and stir to prevent them from sticking together. Simmer 12 to 15 minutes or until noodles are tender. The summer soup I made last week was no big deal but it was everything. It was good old green bean and potato soup, but elevated to the sublime. In the summers of my childhood and probably yours, too, the big soup pot came out when green beans were in season. They were called string beans or snap beans then, and they were the basis of at least one gigantic, cheap meal in mid summer. My mother would toss a ham bone, handfulls of green beans and cubed potatoes into a pot and boil everything until the meagre shreds of ham fell from the bone and the vegetables were soft. Really soft. We ate the soup with buttered bread. I was reminded of the meal after I asked for ways to use up the boatload of green beans Tony grew. I got a few recipes for bean salads and side dishes, a recommendation to roast the beans (which I do) and two huzzahs for canned dilly beans. But the suggestion that stuck with me was the one for green beans, potatoes and ham. Could I elevate it enough to appeal to more sophisticated tastes? I started by making a rich stock with a meaty ham bone (I got mine at Honey Baked Ham). I simmered the bone for about three hours, until the broth had lots of flavor. Already I was way ahead of my mother’s soup. Then I cut the beans and potatoes into smaller pieces than Mom did, added salt, and gently simmered them in the stock just until the potatoes were tender — about an hour less than my mother did. The soup already tasted pretty good, but the capper was a spoonful of pesto stirred into each bowlful. This is how the French amp up the flavor of their Provencal vegetable soup, pistou. The French version of pesto does not include Parmesan cheese, but I like the umami undertone the cheese contributes. The garlic, basil and olive oil in the pesto melt into the soup and infuse every spoonful with bright Mediterranean flavors. 1. Buy a really meaty ham bone. Mine had plenty of meat on it after I sliced off at least a pound for sandwiches and to add to the soup at the end. 2. Simmer the meaty bone a long time (about 3 hours) to make a rich stock for the soup. 3. Cut the vegetables into fairly uniform 1- to 1 1/2-inch pieces and use enough to provide a good ratio of vegetables to broth — in other words, more vegetables than our moms used. This is what I call a great way to use up green beans. Cut excess meat from ham bone, leaving at least a cup or two on the bone to flavor the broth (just eyeball it). Dice enough of the ham cut from the bone to equal 1 1/2 cups, reserving remaining ham for other uses. Place meaty ham bone in a 2-gallon soup pot and cover with water. Bring to a boil, partially cover and adjust heat until it gently simmers. Simmer for about 3 hours, adding a quart of water midway through if necessary, to keep pot about three-fourths full. Taste broth for richess after three hours and if satisfied, remove ham bone. You should have about 3 quarts of broth (a 2-gallon pot will be not quite half full). Add potatoes to pot and simmer for 5 minutes. Meanwhile, remove meat from the ham bone. Add beans and salt to the soup. Return ham-bone meat to the pot. Stir in reserved cubed ham. Simmer until the beans are tender and the flavors have blended, about 10 to 15 minutes. Taste and add more salt if necessary. Ladle soup into bowls. Stir a rounded teaspoon of pesto into each bowlful. Makes about 10 servings. I have had a plethora of green beans in years past. I mean garbage bags of them. I donated them to the Food Bank and/or Good Samaritan Hunger Center. Dilled green beans are easy to put up and last a long time. Occasionally I will use them as appetizers with cream cheese and dried beef. Roll them up and slice. Everyone loves them. I like green beans roasted with halved garlic cloves and lemon slices, or simply with a handful of fresh-grated Parmesan cheese tossed on at the end of roasting. And I still enjoy green beans almandine. For about a peck of green beans, saute about 2 cups of diced onion in about 1/2 cup olive oil until wilted. Stir in 3 or 4 cloves of finely chopped garlic, about 3 cups chopped fresh super-ripe tomatoes and about 1/2 bunch chopped parsley. Cook until the tomatoes start to soften. Dump in your washed and snapped green beans and stir well. Cover, reduce heat to low and cook until very tender (maybe 1 to 2 hours). Salt and pepper to taste. Great way to use up beans you already cooked and have leftover. Dress beans with a final drizzle of olive oil before serving. 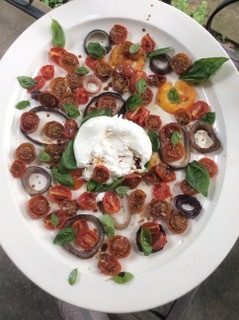 I make a Caprese-style salad with tomatoes, fresh mozzarella, balsamic vinaigrette, basil and green beans cooked until fork tender. You can eat it warm if you can’t wait but chilled is good, too. I make Italian green beans with bacon, a fairlly quick recipe I got from “Better Homes & Gardens Farmers Market Cookbook.” Four slices of bacon are crisped in a skillet and most of the drippings are poured off. Butter is added along wth sliced carrots, cut and parboiled green beans and a clove of chopped garlic, and sauteed until the vegetables are al dente. Ground pepper and the reserved bacon, crumbled, are added to serve. Two miniature zucchinis have finally sprouted in my garden. Should I split and grill them with a lashing of sweet soy sauce or wait until they get bigger and stuff them? If you have been luckier than I have, or know where to get an armload of the vegetables, you may want to bring a fabulous zucchini dish or two to the Seville Farm Market on Aug. 11. That’s when this year’s Zucchinni Smackdown will take place. There’s no need to pre-register. Just take your sweet or savory zucchini dish, along with the recipe, to Maria Stanhope Park in Seville by 10 a.m. that Saturday. Please make it good, because I’ll be sampling the entries this year. Prizes will be awarded in three categories: best savory dish, best sweet dish, and biggest zucchini. Get cooking. 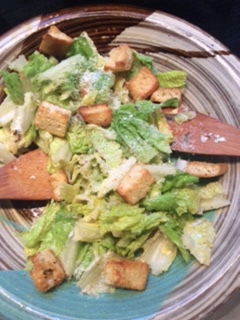 Butter-fried eggs with horseradish; cheeseburger patties on romaine leaves with horseradish pickles and a side of grapes; Genghis Khan (grilled Japanese thin-sliced marinated lamb), boiled corn on the cob, sweet potatoes; hummus with jicama dippers; salade Nicoise with gin and tonics; Caesar salad and shrimp cocktail; green beans, ham and potato soup with pistou; chocolate pudding. Just-picked corn, a gorgeous salad of home-grown lettuces, nasturtiums and other goodies, sliced cucumbers in a luscious creamy dill dressing and home-grown strawberries (!) at the home of friends, who harvested the vegetables and fruit just before we ate. Perfect. I made a muffin microwave recipe in five mugs — three solid black, two mostly white, all of them the same size. I lined up the mugs and added all of the ingredients in each and microwaved them separately. The muffins in the white mugs were 1 1/2 inches taller than the ones in the black mugs. I didn’t realize the color of the mug would make such a difference. I doubt it was the color. The cups may be the same size but not the same thickness or composition. This was a maddening problem for me when writing my book. I finally used just one type of mug — a 12-ounce Fiesta. Then I discovered I had to account for WHERE in the oven I placed the mug. Center placement does not deliver the same cooking power as off-center placement does. And on and on. The bottom line is that microwaving is an inexact science.